There were many fresh teas in my cup through the summer. Top grade gyokuro and kabuse from The Teamountain, first flashes, both green and black, from Nepal, generously given by friends from Darjeeling.cz, powerful shengs from chawangshop's and teaurchin's selections and I enjoyed every sip of them. Despite of the season, I boldly combine these with mid-aged and aged shengs. Two samples I am about to talk today were nicely sended by Peter from Pu-Ehr.sk. One fresh, one mid-aged, but both teas came from - sit down please - Lao Banzang. The aroma of wet leaves, as well as first two brews, are here as a proof of Taiwanesse storage. I have heard some complaitns about such thing, but I, in most cases, do not mind. After those two, in third brew the leaves already talk in Banzang-bamboo language. Probably thanks to my light dosage, I did not find there the renowned bitterness of LBZ, but bamboo sweet taste was combine with calming energy, calming Qi performance, if you wish. When I put my expectation of powerful bitterness aside, I like that tea a lot. My short note says "bit like aged oolong - mouth are full of complex, sweet taste". I just promised myself that if I will have a chance, I will try to make it in "more leaves- shorter times" fashion. Second sample was fresh one and labeled as Lao Banzang 2013. Pictures are from today morning and I can still evoke a clear memory of its aftertaste in my mouth. What you can see on the picture above are half broken leaves from bottom of the sample bag. But originally leaves were very long, nice looking spaghetti style (as I call leaves, which have to be soak first to fit into my small pot). Hairy, greeny-grey and clean - It is fancy tea indeed. Young, strong, bitter...why I am drinking such thing? To paraphrase The Verve's song "Couse it's Bitter Sweet symphony, this life tea..." When assocations like wormwood or dardelion are crossing my mind, I am enjoying thick liquor. Especially from fourth brew, when the first power steps back a bit, I found the mouthfeel to be very pleasant. And my empty cup is full of flowers....How is that happened? Long-lasting aftertaste is what I remember from this morning most. Maybe you know that feeling: Your mouth and mind are so coated in tea that you don't want to drink even water. You don't want to lose that moment...then you know: The aftertaste is good! When I am wondering now, which of those two LBZ teas I would like to have more in my collection, I would say The 04 bamboo version. I know, the fresh 2013 cake is probably better tea - stronger, cleaner and more noble. But the age and most importantly its medicinal impact on my body and mind talk for small leaves stored in bamboo tube. 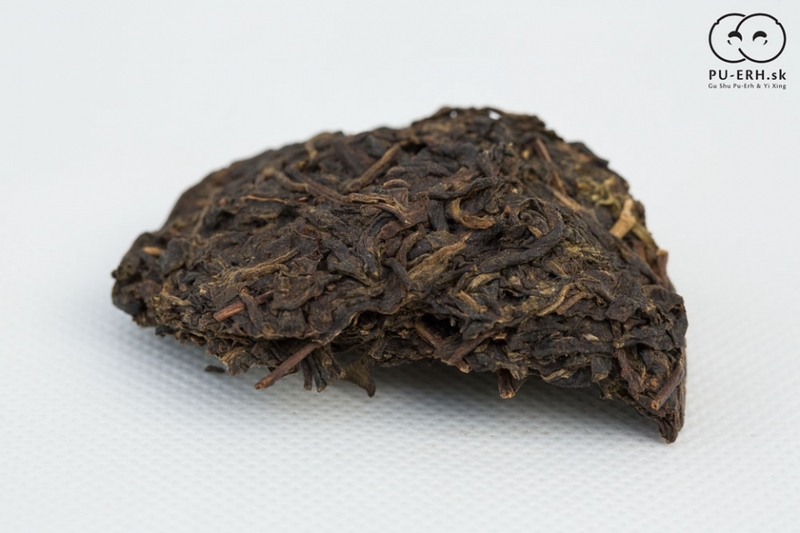 When I talk about teas from Lao Banzang I can not miss prices...As you can expect, those teas are expensive. I also just find out that they are already sold out. Peter told me that he is trying to get more of the 04 one. He has offered this tea for around 60USD for 100g. The fresh cake was much more expensive, if I am counting right then 160USD for 100g. Most of us are not going to buy a tong of such tea, are we? But good thing is, that Peter (and others) gives us opportunity to buy small samples. A chance to try expensive and rahter rare teas in middle of Europe, a chance get a bit more experienced. Few grams of tea leaves can make a difference in our day, in our live, in our world. Thanks for that. Thank you for sharing this mouth-feel with us; truly a delighted-appreciative read! I thought the 04 one to be pretty good, I guess I'll buy some when it is restocked. One does not find this nice Banzhang for reasonable price these days. I think that none of the pre-2005 Banzhangs I had was significantly bitter... I think they tend to transform the bitterness rather soon. I love to follow your articles and blogs a lot and with bated breath every time I keep waiting for your next write-ups. Your article on buy green tea tea is simply awesome. I have not only bought green tea but havealso experienced its benefits. I have lost a lot of weight and I just can’t stop dancing around with joy. Thanks a lot. Dear Sanjay, With all respect, please dont put direct links to comments here. I dont want to make this place "spamy". Thanks. That's a nice article and delivered with a nice detailed finish. Thanks very much. I have just been in Kunming where some of these puer teas were on offer.